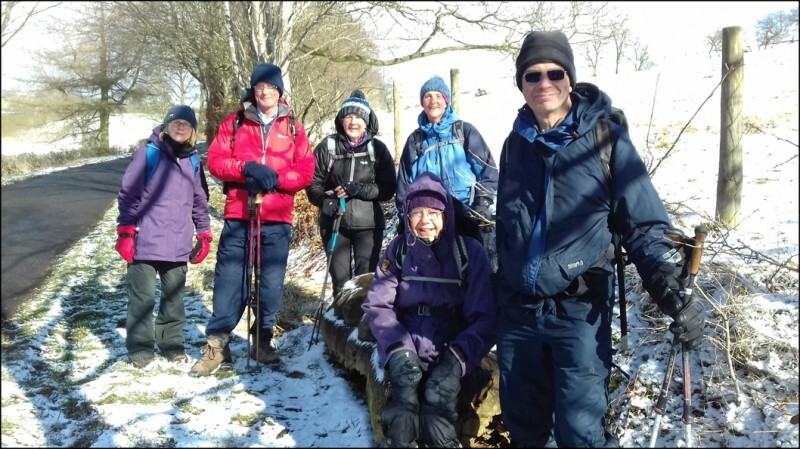 Seven souls braved the wintry forecast and convened on the bridge at Armathwaite. Guest, Diane had made a supreme effort in travelling from the wilds of West Cumbria. 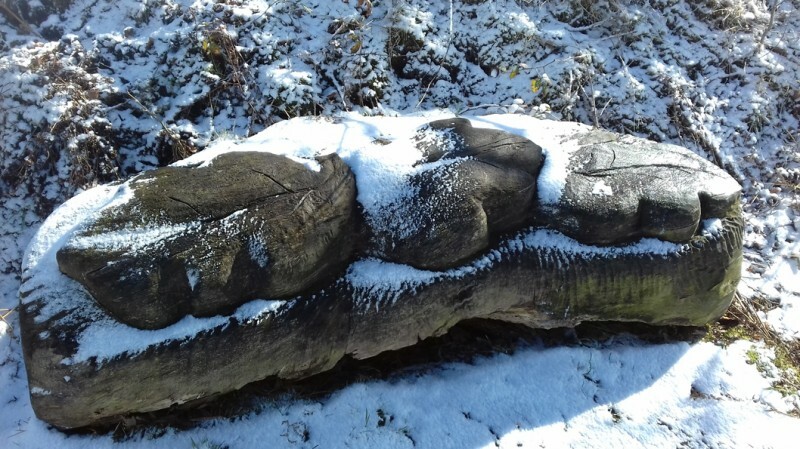 Snow was falling gently and after a chilly start, the initial climb through Coombs Wood brought some warmth. 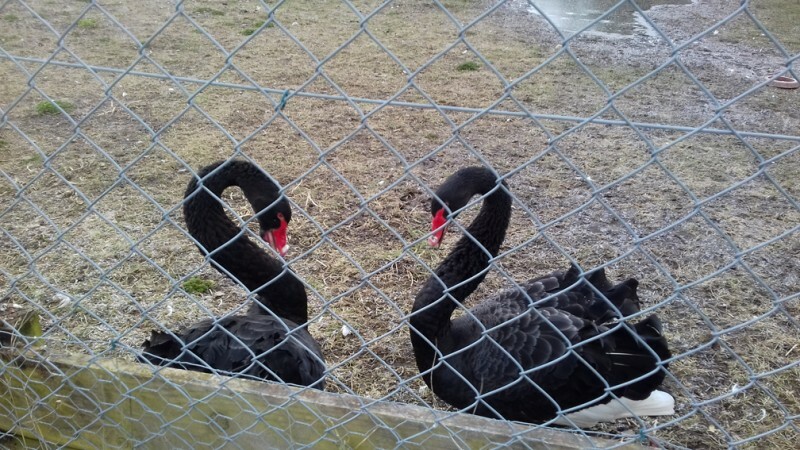 On leaving Coombs Wood, a short section of road took us through Longdales, where we admired the unusual breeds of poultry and black swans, before continuing across fields to Ruckcroft. Further field paths took us past Barugh Cottages, Slack Farm and Walmersyke Farm where we had coffee by the Wallmoor Sike (which feeds into the Croglin Water, our next objective). 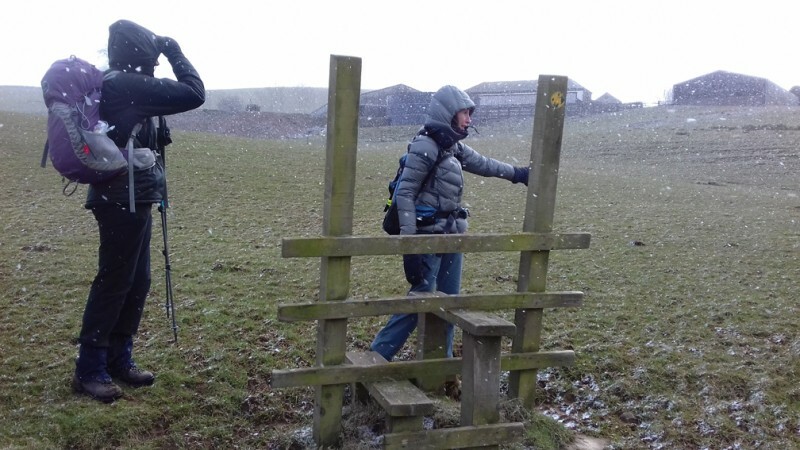 A missing stile, which had presented difficulties on the recce received further investigation at Croglin High Hall Farm and we continued on the original route, along field paths, above the Croglin Water. 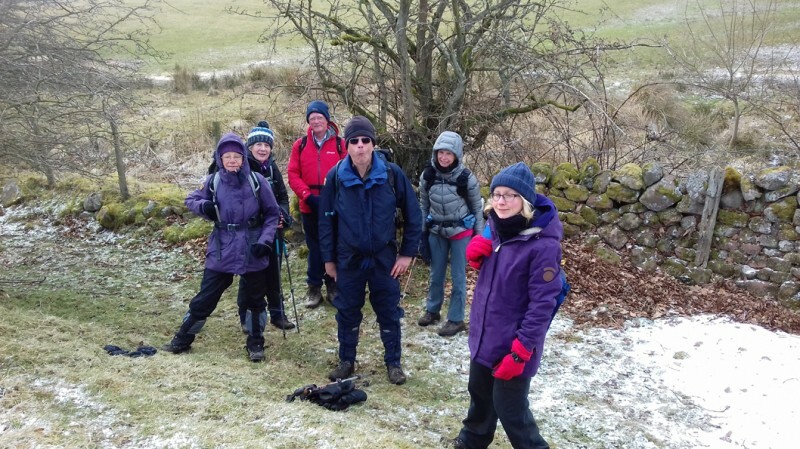 Just after Caber Farm, snow flurries began in earnest and resulted in red-raw faces amongst the group. Thoughts were turning to sitting by the fire with a cup of tea! On reaching the road into Croglin, we were treated to the spectacle of a red squirrel, who observed us from his lofty perch in a hawthorn tree. 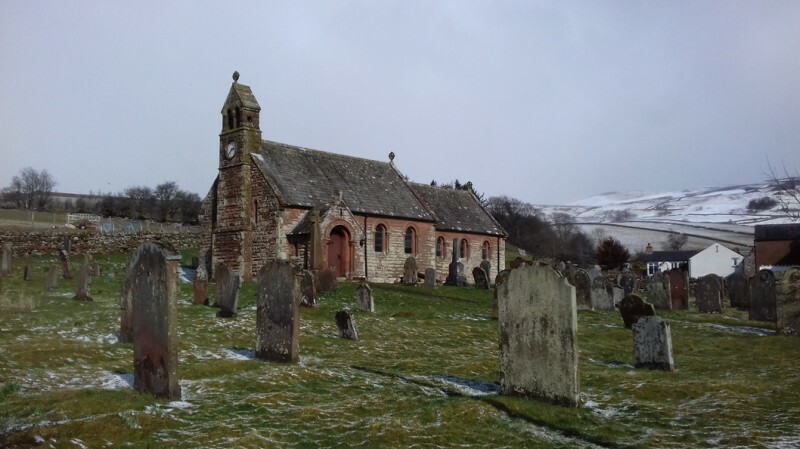 A brief pause in Croglin to admire the Church (now redundant) then it was onwards and upwards to the shoulder of Newbiggin Fell. 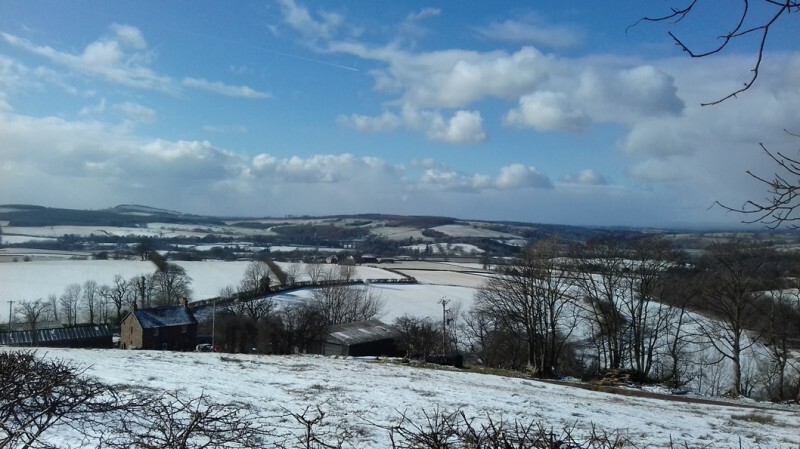 Unfortunately, the snow showers succeeded in obliterating any views of the distant Lakeland Fells. The prospect of lunch in this bleak setting was not appealing. The route continued down to Newbiggin and skirted Foulsike Wood. The greater part of the wood had been felled, leaving a row of trees on the very edge. 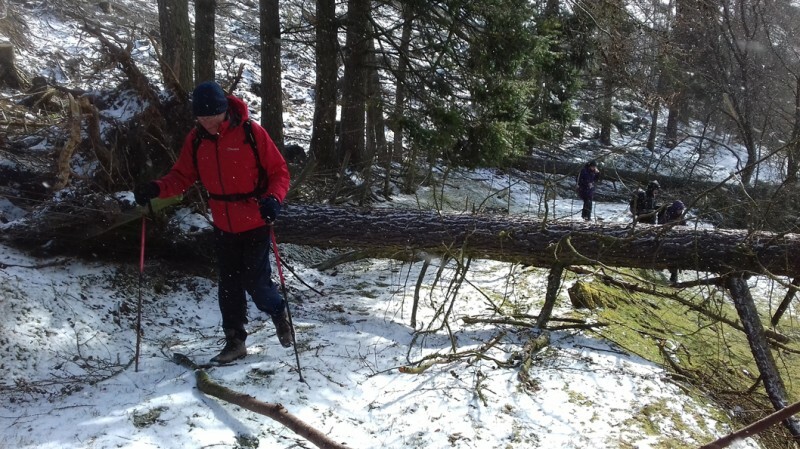 Unfortunately, between the recce and the day of the walk, Storm Emma had conspired to create a sylvan obstacle course for us. Many of the remaining trees had been uprooted and lay across the footpath. A cold and necessarily brief lunch break was taken amongst what little tree cover was available. After lunch, following some clambering over, around and under the tree trunks, we emerged from this tricky stretch onto the road north of Newbiggin. A short lonning took us to the next road, which we followed for approximately a mile, before turning right at Cairnhead Farm. A further stretch of road walking led to Ainstable, with excellent views of the Drybeck Viaduct on the Settle-Carlisle Railway. Back on footpaths, the route skirted Ainstable, St Michael’s Church and followed field paths to the road at Townhead. A short section of road walking followed to Common House and the final part of the walk. Field paths led down to Oatlands cottage and the River Eden. A pleasant return alongside the Eden rounded off the walk. Back at the cars, there was no appetite for hanging around, as the next snow flurry was making its presence felt.